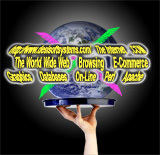 How is your web site working for your business? Are your customers confused? Can they find the information they need? Are your server applications working efficiently and correctly? Do your banner ads or navigation graphics need updating or optimizing? DesiSoft Systems can build your custom-designed web site, develop your Internet application, or update your existing site or application to satisfy your specific needs. We specialize in Perl, Apache Web Server, Unix, Adobe Photoshop, Adobe Illustrator, Macromedia FreeHand, and a number of other Internet and web-based technologies.